Turn any gathering into a special occasion. 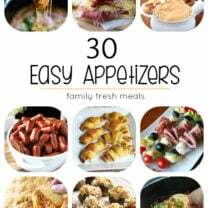 Thanksgiving is coming up, and that means a lot of us are going to have a whole houseful of guests to feed. Well, one classic dish that can feed a big crowd is a ham. And plain baked ham is fine, but it’s just not that exciting. Sounds like a job for my Sweet Chili Glazed Ham. Actually, it’s kind of cheating to call it “my” Sweet Chili Glazed, because it’s just sweet chili sauce that you can buy in a bottle. All I did was figure out that when you baste it onto a ham, about an hour before it comes out of the oven, magic happens. 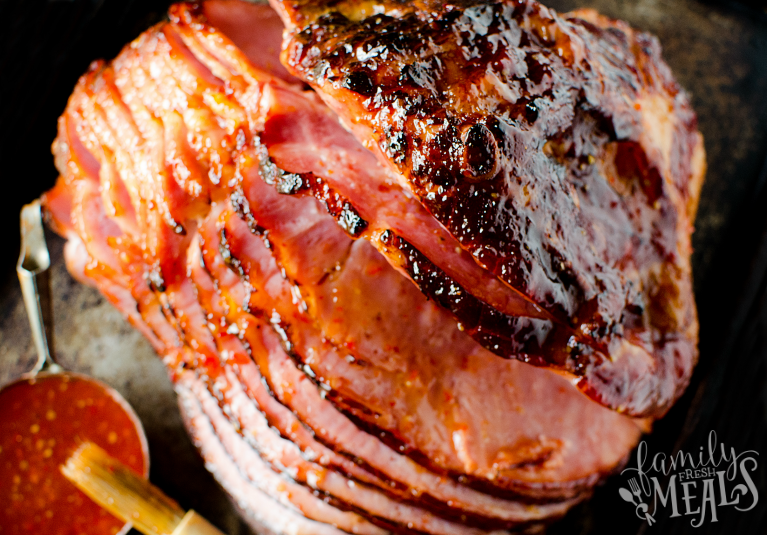 The chili sauce caramelizes all over the surface of the ham, forming this gorgeous, dark, crispy crust. 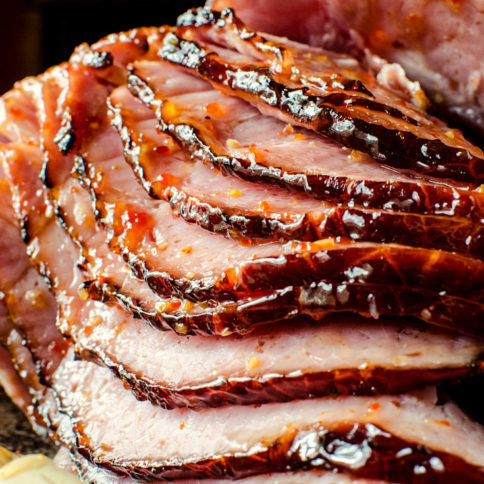 And when you bite into it, the sweet and spicy sauce blends with the salty ham to create this incredible flavor fusion. 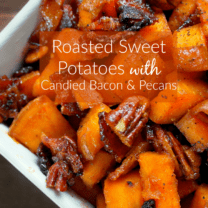 It’s like throwing a party for your taste buds and inviting all their best flavor friends. 1. Preheat the oven to 275 degrees F. Open the ham and remove all coverings and discard any included glaze flavor packets. Transfer the ham to a baking dish and add a small amount (1/2 – 1 cup) of water to the bottom of the pan. 2. Cover the ham with tin foil. Bake according to the weight of your ham, approximately 18 minutes per pound. As spiral hams are already cooked, you are essentially just warming it through. 3. For the last hour of baking, you can begin basting the ham with the sweet chili sauce. Slightly heat the sauce slightly in the microwave so it spreads easy. Open the oven, remove the foil, and baste the ham all over. Baste every 15 minutes. 4. Check in the internal temperature of the ham. It should be at 140 degrees. 5. On the last basting cycle, if there isn’t enough caramelization on the ham, then turn your broil function on and broil it for 1 – 2 minutes. Watch it closely as it can burn easily!! 6.Remove the ham from the oven and replace the foil LOOSELY and let it sit for 10 minutes before slicing and serving. A plain baked ham is fine, but it’s just not that exciting. Sounds like a job for my Sweet Chili Glazed Ham recipe. Everyone will love this ham! Preheat the oven to 275 degrees F. Open the ham and remove all coverings and discard any included glaze flavor packets. Transfer the ham to a baking dish and add a small amount (1/2 - 1 cup) of water to the bottom of the pan. Cover the ham with tin foil. Bake according to the weight of your ham, approximately 18 minutes per pound. As spiral hams are already cooked, you are essentially just warming it through. For the last hour of baking, you can begin basting the ham with the sweet chili sauce. Slightly heat the sauce slightly in the microwave so it spreads easy. Open the oven, remove the foil, and baste the ham all over. Baste every 15 minutes. Check in the internal temperature of the ham. It should be at 140 degrees. 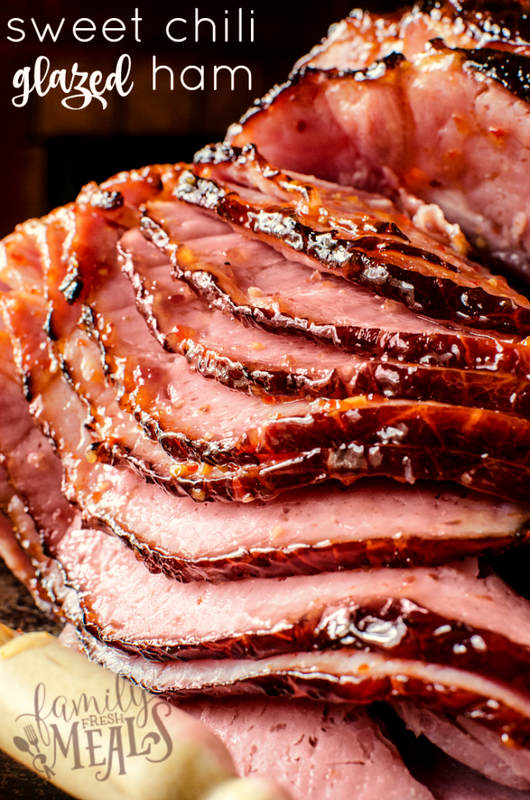 On the last basting cycle, if there isn’t enough caramelization on the ham, then turn your broil function on and broil it for 1 – 2 minutes. Watch it closely as it can burn easily!! 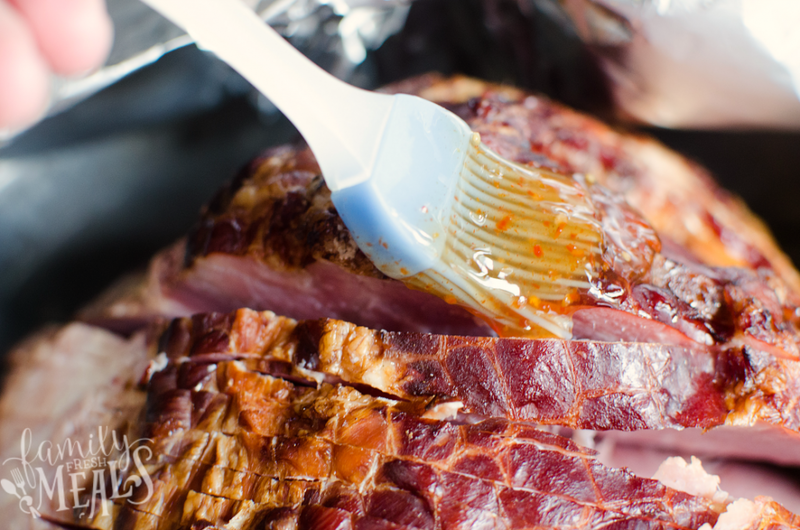 Remove the ham from the oven and replace the foil LOOSELY and let it sit for 10 minutes before slicing and serving. 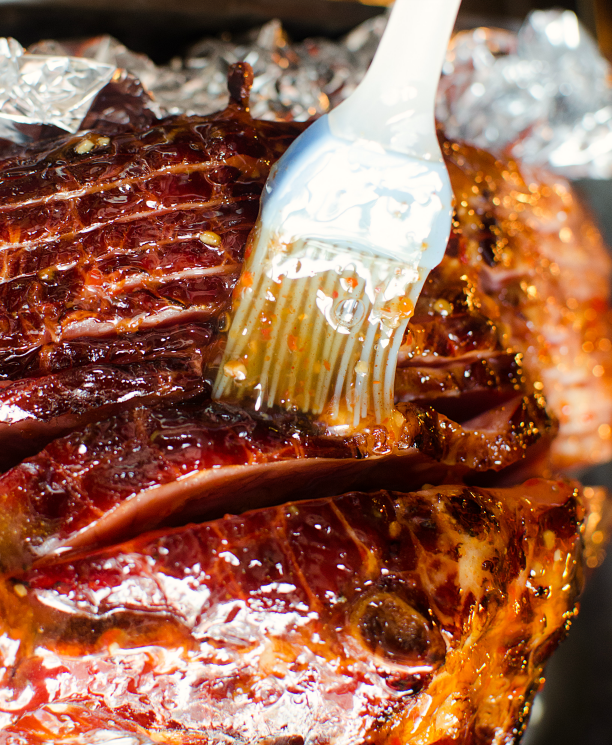 We’re doing ham for turkey this year at Thanksgiving…Lord knows why, but this glaze sounds awesome! Definitely going to try it out on the ham, hopefully it’ll be a nice break from the traditional honey glaze. Personally I love sweet chili sauce, hopefully its as popular with everyone else. This is the ONLY way to eat ham. My family has been doing this since I was born in the 60’s and I am sure they got it from my grandparents. 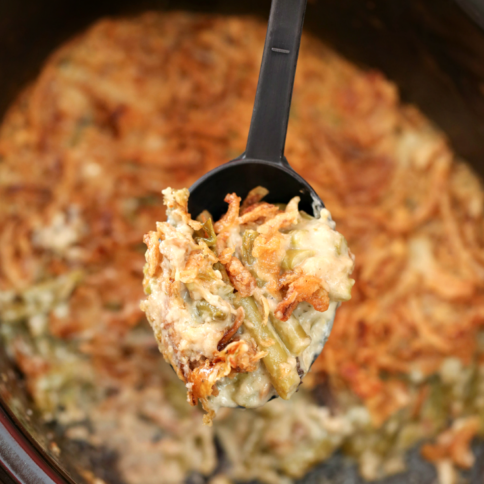 The only thing we do different is not to cover it with foil and also add 2 bottles full of water to the pan. When the ham is done pour the sauce into a bowl and use it on the ham and as a gravy for mashed potatoes. It’s the best! 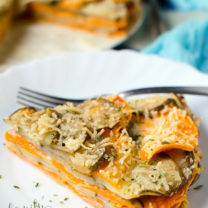 When I tell my friends about this recipe they give me a funny look…LOL.